Meets or exceeds ASTM F2412-11 and F2413-11 I/75 C/75 EH standards. Meets or exceeds ASTM F1677-96 Mark II non-slip testing standards. 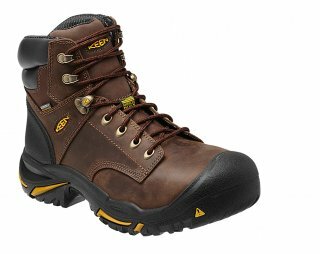 This hard-working, high-performance boot is built to handle medium to heavy-duty work. It's waterproof, and the non-slip outsole stands up to the slickest work sites. Asymmetrical steel-toe protection ensures an anatomically correct fit, and the resilient, shock-absorbing midsole provides comfort that doesn't quit.